A high level summary, next steps and what you can do list can be found below. At our January 7th SRNA monthly Board meeting we took time to answer questions from those in attendance about the evacuation decision process. We also started documenting the “key questions” that you wanted to see answered by Travis County before moving forward with any option. Our goal of this exercise is to increase the understanding between Travis County and the community so that future updates are likely to answer as many of the most important questions as possible. We will keep you updated. How will the traffic flow metrics be computed including how to account for each path’s capability; e.g. using existing traffic? Location on RM620 (of the proposed intersection) – is it safe, such as accounting for nearby curves, etc. 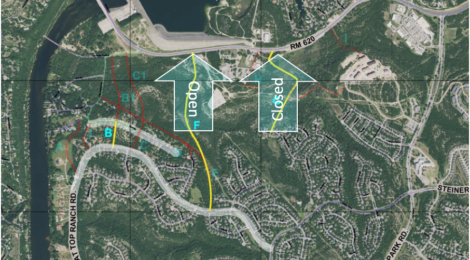 Three options have been presented as the “final options” from the County to provide additional evacuation and emergency access options for Steiner Ranch: Options “B”, “G”, “F”. Option “B” has since been identified as having a planned home construction.This leaves option “G” and option “F”. Option “G” is an evacuation only road proposed off of Medina River Way. Option “F” is proposed as an open road off of Flat Top Ranch Rd. – meaning it would be available for everyday use, to provide both emergency and additional everyday access to RM620. Travis County has begun a process to answer open questions raised about the remaining options. These include the effectiveness of the roads (F and G) for emergency use and importantly the expected traffic patterns and volumes for Route F – some initial numbers quoted for traffic volumes turned out to not be based on any traffic analysis. Many questions were answered at the meeting including clarification that option F would not run down the middle of Westridge Park (an updated drawing was subsequently provided showing an approximate road line). See the full update (posted on SRNA website Dec 19th) including hi-res images: HERE. Including a detailed summary of the meeting, questions and answers and the presentation slides made available Dec 18. Traffic study being conducted by the County in January-February time-frame. The outcome of the traffic study and any other new information will be made available to the community likely in late February or March. The County will take input from the community directly and will consider what direction to pursue. An open house will be scheduled after the County has considered community impact and proposes a solution. Officials have not yet taken an official stance on this issue and most are awaiting the full data and analysis of the options to be complete. SRNA will continue to convey as much detailed information as possible as it is made available. SRNA is committed to ensuring that all options are fully evaluated to best inform any decision so that all implications can be understood. This is especially important when considering a change such as adding an open road. You can also watch for notices and engage with your local HOA representative (if any) on this issue – SRMA for example is planning to discuss this matter as a Board after further information (such as the traffic study) is made available from the County.